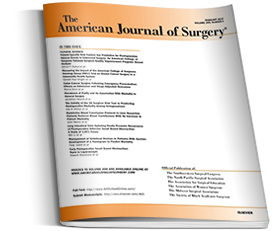 The American Journal of Surgery is a paid circulation, refereed journal reaching approximately 6,000 surgeons, who are buying influencers in this market. These include general surgeons who perform abdominal, cancer, vascular, head and neck, breast, colorectal, and other forms of surgery. Ninety percent of AJS subscribers are board certified and the rest are board eligible. AJS is an independent medical journal providing superior clinical editorial articles and is the official publication of several major surgical societies. In addition to publishing some of these societies’ rigorously review annual meeting papers, the AJS publishes free-standing, independent peer-reviewed articles. This provides for superior editorial content and balance. All articles are referenced in Medline and are thus part of an international referenced source of medicine and surgery. Two of every three subscribers are high readers and more than half indicate that they read every issue. More than 90% of all respondents to a recent survey had read all or part of a test issue. AJS has one of the highest readership-to-recipient rates in the field, and in a recent year readers placed orders for nearly 20,000 reprints.